Castle Rock Quilt Club - Charity Quilts If your organization is interested in receiving a charity quilt, please fill out the Charity Quilt Application and submit it to president@crqc.org or mail it to Lois Routh34 Bristol St.Castle Rock, CO 80104 2017 Charity Quilt Awarded to Sedalia PTO for Auction to raise money for school supplies. The CRQC 2016 Charity Quilt was awarded to Suzie McKenzie from Eagle's Nest Ranch, Elizabeth 2016- This picture is of Laura Clark of Wives Behind the Badge Colorado with her husband and youngest son. Her husband is with the Denver Sheriff's Department. We donated 8 children's quilts to their organization. Three of those quilts were going to Pueblo for the children of an officer recently killed in the line of duty. The remaining quilts they will keep and use as needed by the families of law enforcement officers.﻿ We have provided Charity Quilts to several organizations this year !Our Charity group was blessed with 3 BIG bags of fabric from a local lady that was cleaning out her stash. The bags were full of a great variety of fabrics of all sizes, colors and styles! We were so appreciative! Kits are being made up for anyone who would like to make a charity quilt from some of the remaining fabrics. Feel free to pick up a kit or two at our general monthly meeting or contact Lois Routh at LERouth@aol.com to make arrangements to pick up a kit or fabric. Make up a top or a finished quilt, bring it back and it will be distributed to the next group in need. Here is what we have done with some of the quilts made with the fabrics...*In October 2014 Mary Beth Burns, and Elaine Thornton, along with Kailen who made one of the donation blankets, delivered 27 quilts of various sizes, 2 crocheted blankets, and 8 babies hats to the Denver Health Hospital NICU department. We were allowed to hand out a few to the newborns and siblings who were there that day. Thanks to everyone who donated their time and efforts to allow our club to donate to these families. Here is some pictures and a touching story from the Almost Home Auction that we donated some quilts to. Our quilts brought in $775 for the auction. We auctioned off three of the quilts, one for $150 (it was red white and blue), Judith’s went for $350, and one of the pink ones (I’ve attached a photo) went for $275. The other two quilts will be placed in our shelter (Your quilt, and then one of the other pink ones), which we are very excited about. Our guest speaker for the evening was Deb Fisher, a woman who was a former client of Almost Home. She stayed in our Shelter for 60 days, and then moved into our low-income housing complex. She then was able to get into a habitat for humanity house and get a job at Mile High United Way. She is a very inspiring woman. The entire time she was experiencing homelessness and renting a low income unit, she was taking care of her grandchildren, josh and Alissa, whom she brought to the event. 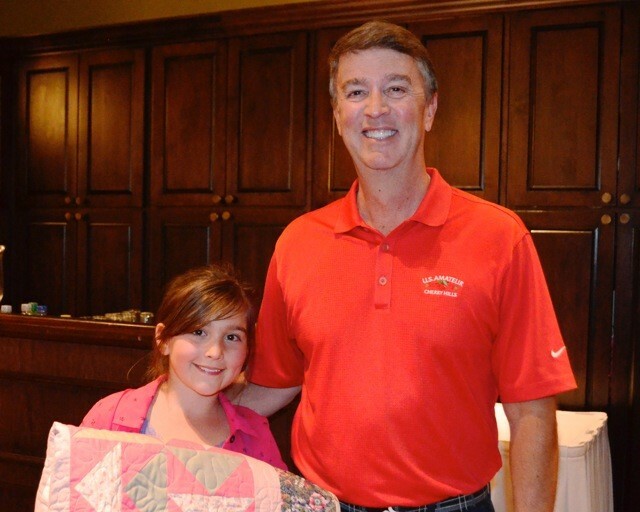 When we were auctioning off the quilts, a community member purchased one of the pink quilts for $275. Upon receiving it, he promptly got up, and wrapped it around the shoulders of Deb’s granddaughter Alissa. It was incredibly touching. I’ve attached a photo. Deb received a standing ovation after her speech, and when the man gave Alissa the quilt, people were tearing up all over the room! Charity Quilt for 2011-12 This Charity Quilt is made of a variety of beautiful blue and white stars. This years Quilt will go to the American Foundation for Suicide Prevention, Colorado Chapter. Awarded to Sedalia PTO for Auction to raise money for school supplies. 2016- This picture is of Laura Clark of Wives Behind the Badge Colorado with her husband and youngest son. Her husband is with the Denver Sheriff's Department. We donated 8 children's quilts to their organization. Three of those quilts were going to Pueblo for the children of an officer recently killed in the line of duty. The remaining quilts they will keep and use as needed by the families of law enforcement officers. 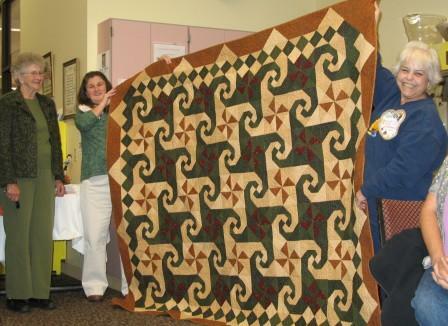 We have provided Charity Quilts to several organizations this year ! Our Charity group was blessed with 3 BIG bags of fabric from a local lady that was cleaning out her stash. The bags were full of a great variety of fabrics of all sizes, colors and styles! We were so appreciative! Kits are being made up for anyone who would like to make a charity quilt from some of the remaining fabrics. Feel free to pick up a kit or two at our general monthly meeting or contact Lois Routh at LERouth@aol.com to make arrangements to pick up a kit or fabric. Make up a top or a finished quilt, bring it back and it will be distributed to the next group in need. 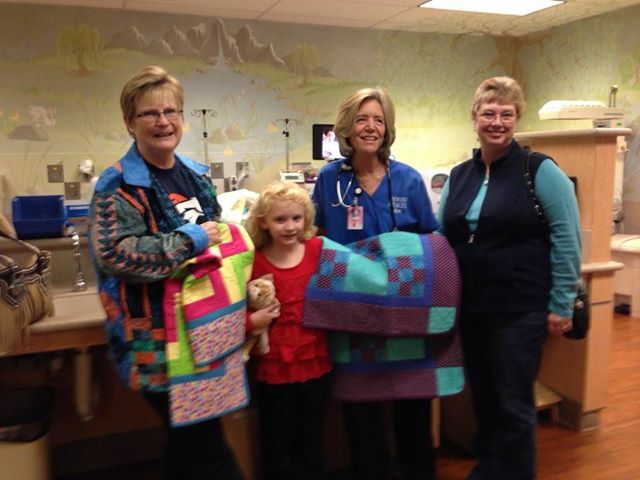 *In October 2014 Mary Beth Burns, and Elaine Thornton, along with Kailen who made one of the donation blankets, delivered 27 quilts of various sizes, 2 crocheted blankets, and 8 babies hats to the Denver Health Hospital NICU department. We were allowed to hand out a few to the newborns and siblings who were there that day. Thanks to everyone who donated their time and efforts to allow our club to donate to these families. Here is some pictures and a touching story from the Almost Home Auction that we donated some quilts to. Our quilts brought in $775 for the auction. We auctioned off three of the quilts, one for $150 (it was red white and blue), Judith’s went for $350, and one of the pink ones (I’ve attached a photo) went for $275. The other two quilts will be placed in our shelter (Your quilt, and then one of the other pink ones), which we are very excited about. Our guest speaker for the evening was Deb Fisher, a woman who was a former client of Almost Home. She stayed in our Shelter for 60 days, and then moved into our low-income housing complex. She then was able to get into a habitat for humanity house and get a job at Mile High United Way. She is a very inspiring woman. The entire time she was experiencing homelessness and renting a low income unit, she was taking care of her grandchildren, josh and Alissa, whom she brought to the event. 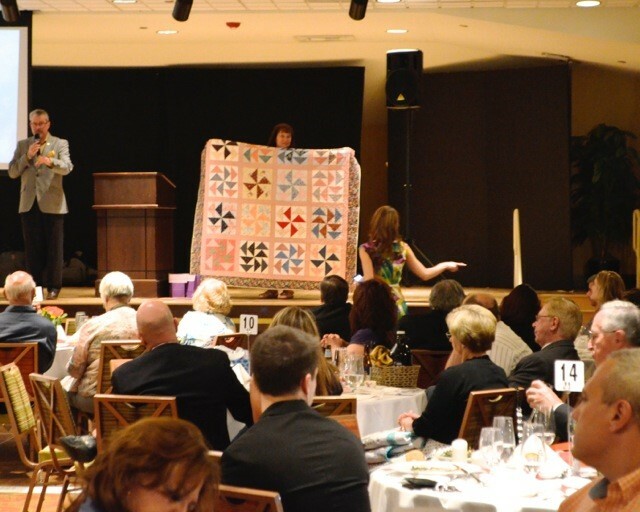 When we were auctioning off the quilts, a community member purchased one of the pink quilts for $275. Upon receiving it, he promptly got up, and wrapped it around the shoulders of Deb’s granddaughter Alissa. It was incredibly touching. I’ve attached a photo. Deb received a standing ovation after her speech, and when the man gave Alissa the quilt, people were tearing up all over the room! 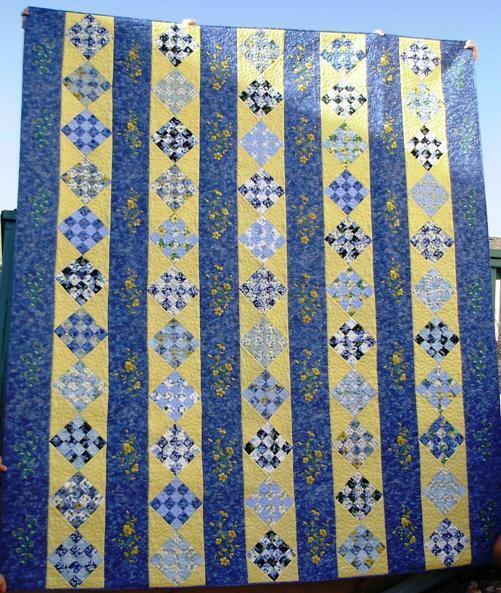 This Charity Quilt is made of a variety of beautiful blue and white stars. This years Quilt will go to the American Foundation for Suicide Prevention, Colorado Chapter. St. Vincent de Paul Society.